My previous post on “Wild” contained a quote from the film’s location manager that claimed the inaccurate and easily accessible locations were necessary compromises. Most of the time you just can’t send a movie crew out into some of these places. You need locations that are accessible, cinematic and can serve several purposes so the crew doesn’t have to pack up each day. Let’s hope she’s had a chance to see “Force Majeure,” Sweden’s entry for Best Foreign Film, because it make a mockery of her claim. Although a psychological drama with comedic elements, “Force Majeure” is a masterpiece of outdoor filmmaking that makes the most of its stunning location, a ski resort in the French Alps. Beyond shots of chair lifts and ski runs, the director, Ruben Ostlund, and his two DPs, Fredrik Wenzel and Fred Arne Wergeland, use beautifully composed long shots to establish the locations and its characters place within them. So along with the medium and close shots of the actors–an attractive young Swedish couple, Tomas and Ebba, and their son and daughter–we see their environment from afar, perched on a plateau surrounded by mountains. We see not only daytime ski runs but the nighttime march of snowcats on the mountainside, and the snow machines at dawn. It didn’t surprise me to learn later that Ostlund got his start making ski documentaries, since he films every aspect of the resort and the skiers so expertly. When Tomas and his Norwegian friend ski in deep powder in a location that must have been accessed via helicopter, the sequence is not only breathtaking but painstakingly composed. I can only imagine how difficult it was to get the crew and equipment there, and how long it took to shoot. Of course there’s a fascinating script beyond the perfect cinematography, and great acting. But what stayed with me the most was the way Ostlund, Wenzel and Wergeland matched the film’s visuals with the unfolding drama. 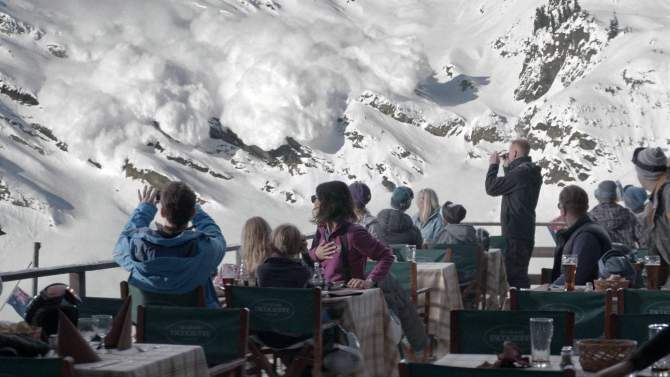 It’s rare to come across a perfect film like “Force Majeure.” See it if you can. You are currently reading “Force Majeure”: Everything “Wild” Isn’t, and More at Under the Hollywood Sign.